Just as September came to a close the International Federation of Robotics (IFR) released its 2014 reports on Industrial and Service robots, revealing strong growth in robot sales in 2013 across all sectors. While the total sales value for service robots decreased slightly in 2013 (to US$ 3.6 billion), the number of units sold was up 4% over 2012 data, and sales forecasts up to 2017 are optimistic. On the industrial side, the IFR reports a 15% increase in industrial installations in 2014 over the previous year, with growth that will “likely continue at about 12% on average per year”. New investments in robotics also provided hope for the future: Jibo’s crowd funding campaign coming to a close at a whopping $2.3 million, making it the most successful technology campaign on Indiegogo to date; Precision Hawk raised $10 million to expand its work in aerial data collection, processing and analysis; and ReWalk Robotics and Corindus Vascular Robotics sold shares for $36 million and $26.6 million to fund their work on exoskeletons and percutaneous coronary intervention devices, respectively. But it wasn’t all good news in robotics business this September: Microsoft laid off its entire robotics team in a tactical move to focus on core areas of strength. The robotics team was not working on robotics systems per se, but rather on tools for robot developers. The battle of the household robots has finally begun – at least when it comes to vacuuming. 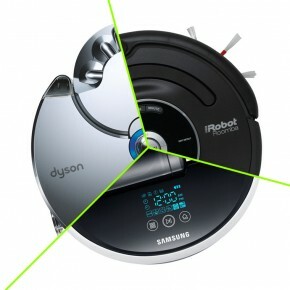 This September, vacuum giant Dyson launched a new robotic vacuum cleaner, the Dyson 360 Eye. Their campaign began with a short teaser video early on in the month, followed by a public launch at IFA in Berlin – the very same day that Samsung announced its own Powerbot VR9000 – signalling that robotic vacuums are transitioning from geek-niche to mainstream consumer product. Due to their long-standing history with Dyson and their huge consumer interest in new technologies, Japanese consumers will be the first to get the 360 Eye, while the rest of us will have to wait a little longer. 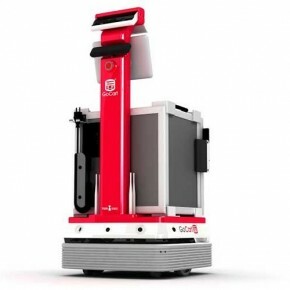 Vacuuming isn’t the only chore robots are taking on: this month a hospital in Paris is trialling two robots to help transport endoscopes throughout their facility; and Korean robotics company Yujin Robot launched GoCart, a meal transport robot designed for service in eldercare, health care and other hospitality facilities. Robots are helping with mealtime in other ways too: Google just bought smart spoon maker LiftLabs, a company that develops smart spoons for people with neurodegenerative diseases; and Hellospoon, a mealtime assistant robot is currently fundraising on Indiegogo. As more products like the 360 Eye and GoCart enter our homes and workplaces, calls to regulate robotics have become louder. This month Ryan Calo made the case for a federal robotics commission. However, others called into question whether this would be the right move, suggesting that we should avoid precautionary, top-down regulation that could stem innovation. Concurrent to the US debate, the European Robolaw project published an EU Roadmap for developing guidelines to regulate robotics. Robohub’s Andra Keay summarised the debate about robot policy for us, calling for change and reform in the robotics policy agenda. We have invited key experts in this debate to contribute to a new focus series on the topic, so watch this space! Researchers continue to develop robots and intelligent systems with surprising capabilities, including systems that can play Atari video games, and or find connections between fine works of art. But just as the the movement of robots into human environments is prompting calls for robot regulation, advances in AI are prompting many argue that robots must be capable of acting ethically if we are to ensure the safety of the people relying on and working with them. Alan Winfield and his team at the Bristol Robotics Lab are trying to figure out how do just that: design a robot that can exhibit ethical behaviour. Despite have built a minimally ethical robot that appears to implement Asimov’s first and third laws of robotics, Winfield argues that people should not fear the evolution of robots or technological singularity. Rather, they should look at current AI and think about how this might be made safer and more ethical. 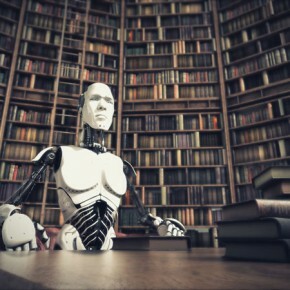 To discourage unwarranted fears of robot terminators taking over the world, a group at Arizona State University is hoping to improve our image of the future – through sci fi! Project Hieroglyph brings together top science fiction authors and researchers to encourage realistic, rather than pessimistic, storytelling. It is hoped that this approach will help to explore how societies might react and change with technological advances. Meanwhile, on the screen, US hit TV series “Person of Interest” is set to explore questions about AI in its new season, and the new movie “Automata” seeks to stimulate a moral debate about robot ethics. While the abilities of robots portrayed in movies are often enhanced by CGI, real robots can feature in a very different way. 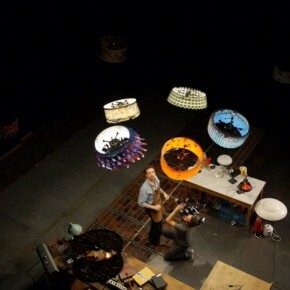 A new short film by Cirque du Soleil, ETH Zurich, and Verity Studios released this September used real quadrocopters to demonstrate how inspiring human robot interaction can be. In an interview with Robohub, Bill Keays, technical advisor at the Cirque du Soleil, explained why they chose to use real robots instead of CGI for the film. Real robots in front of the camera may still be relatively rare; however, robots behind the scenes may soon be commonplace. The FAA is now set to approve drones for use in the film industry in the US, although a number of rather strict requirements must be met for their use to be legal. Summarising the key issues affecting drone use and its history, the Centre for the Study of the Drone at Bard College released “The Drone Primer”. This document offers a comprehensive overview and discussion about drones, including their use in the military, journalism and art. September also saw various other drone related news and features, including: the announcement of the winners of the Drone Social Innovation Award, with a landmine detection project and a project providing disaster relief in the Philippines sharing the $10K prize; the Robots Podcast interview with AirDog, a soon-to-be-released quadrocopter designed to video sports; the announcement by DHL that it is now testing drone delivery, initially transporting medications to an island in the North Sea. The International Conference on Intelligent Robots and Systems (IROS) took place from September 14-16 in Chicago, Illinois, and was kicked off by Peter Corke who gave the plenary session on the first day with an eye-opening history of computer vision; he also announced a new MOOC he is planning to launch soon. You can learn more about Corke’s talk and his MOOC in our Robots Podcast interview. Also announced at IROS was MIT’s robot cheetah, which can run and jump across grass, and Clearpath’s new Jackal ground vehicle. This year presenters were asked to prepare 3-minute mini pitches that would serve as teasers for the interactive sessions, and Robohub captured some of these with our first-ever IROS Webcam, including pitches from Ryan Wolcott (winner of the best student paper award) and Mike Tolley (you may have seen his untethered soft jumping robot on Automaton Blog) – among many others. We hope to bring our webcam to more conferences – so look out for us! With exhibitors such as Rethink Robotics, Kuka, Schunk, Clearpath and many more, experts from the industry track offered advice for startups and entrepreneurs – see our coverage of the IROS Industry Forum. 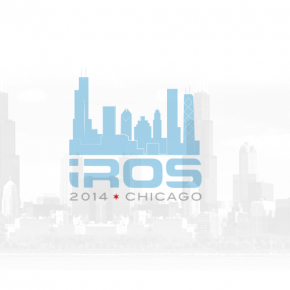 Check out also the winners of the IROS 2014 Baxter contest and the Microsoft Kinect Challenge. Last but not least, it was announced at the IROS Women’s lunch that the next International Conference on Robotics and Automation (ICRA) will have a 50-strong all-women organizing committee – a historic decision for the robotics community. For more stories from IROS have a look at Robohub’s complete event coverage.